A seriously ill child that requires critical interventions is fortunately enough a rare event (even in urban settings). Children unlike adults however can typically not compensate for as long and require active management (that feeling of going fine than falling off a cliff) which can be particularly challenging in a rural setting. Secondly, there are the issues involving; anatomical & physiological differences in children, weight-based fluid and mediation requirements, different equipment and potentially increased difficulty in performing procedures. All of this can up our fear levels and add to potentially ineffective management when it is required. Below is an simplistic approach to the seriously ill child. It is very general, but designed to give you a fall back point when it gets stressful. For disease/illness specific approaches take at look at the Royal Children's Hospital Clinical Guidelines or consider doing an Advanced Paediatric Life Support course. Neonatal resuscitation is a separate entity and will be covered at a later time. Given the relative rarity and the angst around treating an unwell child in Rural Environments, preparation is key in trying to achieve the best outcomes. 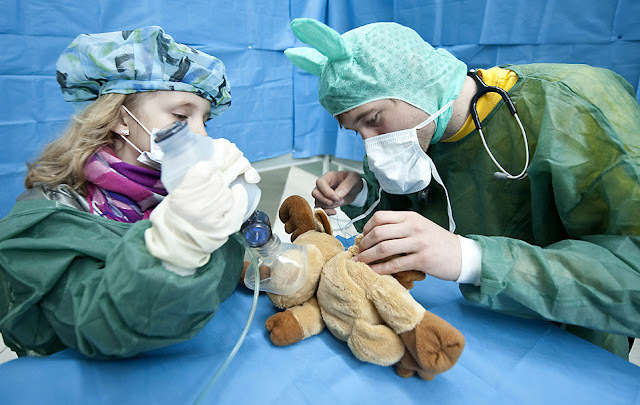 Rural sites can prepare by ensuring processes and checklists are in place, appropriate paediatric equipment (e.g. Non-invasive high-flow oxygen), streamlined referral and telehealth options, education and regularly conducting in-house simulations. The remainder of section will focus on how to prepare when you know a sick child is coming to your emergency department. For resuscitation preparation think P A E D S.
This is typically your resuscitation area in rural facilities, preferably one that has tele-health capacities. The aim of the primary assessment in seriously ill children and infants is to identify the physiological abnormalities, and initiate the most appropriate management strategy to correct these abnormalities. Bradycardia and/or hypotension are OMINOUS, LATE SIGNS. Stroke volume small and fixed in infants, CO more dependant on HR. SV has a greater role with age. Comparing peripheral and central pulse volume may provide help with early detection. Think End organ perfusion: e.g. skin temperature, altered mental state, urine output. Cyanosis, not correcting with O2 therapy. 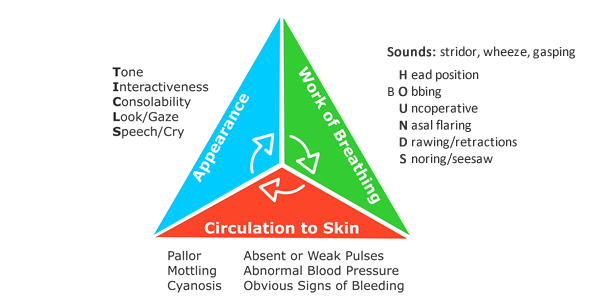 In Paediatric Emergencies AVPU provides a quick a succinct method to gauge level of consciousness. An age appropriate Paediatric-modified GCS could be calculated at a later date. Swift head to toe observation of the child. Formal head-toe examination, should be part of your Secondary Assessment. Maintain Normothermia. Infants lose heat faster. Think about what has gone into the child in terms of fluid (whether oral, IV or other) and what has and will be lost (e.g. diarrhoea, vomiting). See Approach to the Seriously Ill Child - part 2 (still to come). Hopefully with early detection and management you avoid your patient having a Cardiac Arrest. But there is always a possible that they will or that's how they will arrive. Below is a flowchart summarizing the principles of Paediatric Advanced Life Support. 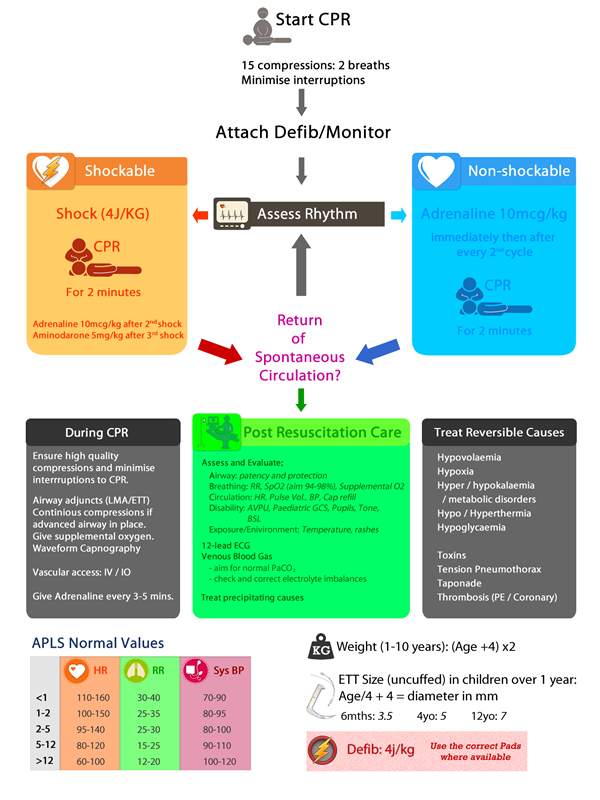 For more details see the Australian Resuscitation Council Guidelines at resus.org.au/guidelines.